Because Turkey is such a rich country in both tradition and history, no Turkey travel guide can expect to cover all of the wonderful things that tourists can find within her boundaries, so here is an attempt at just some of the highlights. Istanbul in the northwestern part of the country offers many Turkey tourist attractions that are in close proximity to each other in the Historical center. Sultanahmet Mosque, Blue Mosque, Hagia Sophia, Hippodrome, Basilica Cistern, Topkapi Palace, Dolmabahce Palace, and many other sites welcome history buffs or those wanting to learn more about the history and culture of the nation. Istanbul is also home to the Grand Bazaar, one of the largest covered markets in the world with more than 4000 stalls and welcoming 400,000 visitors a day, and the Istanbul Archeology Museum, which is not only the first Turkish museum, but also one of the world’s largest with over a million items. Although not everything can be on exhibit at the same time, there are Greek, Roman and Byzantine artifacts in the collection. Located on the western coast of the country is Kusadasi (Ephesus) that has a historical Turkey tourist attraction in the Ephesus (Efeze) ruins from a 100BC town. Miletus is also home to ancient ruins and features a stadium of old and of course, the area is full of Turkish baths and beaches. Aqua Fantasy Land is a great place for family fun as it is a water park filled with wave pools, a lazy river and slides, making it a terrific place to cool off after a day exploring the ruins. Further south is the town on Bodrum with the famous St. Peter’s Castle. Built in the 15th century, when you’re on your Turkey vacation you can take a tour of the grounds and building, and don’t miss out on the dungeon! The Mausoleum of Halicarnassus is one of the seven original wonders of the world and today tourists can explore the ruins and see the foundations of the buildings that used to stand in the area. Everyone loves Santa Claus and the man who started it all was born in Bodrum. Saint Nicholas is also the patron saint of bakers, sailors, Russians and Greeks as well as being the patron saint of children and he was an ancient bishop of the area of Myra. 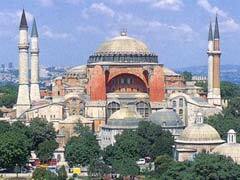 Today, St. Nicholas Church is a Turkey tourist attraction with marbled mosaic floors and wall paintings. The man himself is said to be buried in the church, but different stories about the whereabouts of his grave make it quite a little mystery. 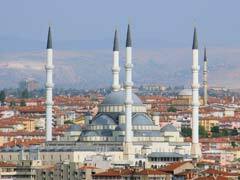 The capital city of Turkey, Ankara, is located in the western part of the country. Many Turkey vacations start in the city of Ankara where visitors can visit the Ataturk Mausoleum, the resting place of Kemal Ataturk who was the founder of Turkey’s republic. On a hill overlooking the city, this area gives lovely views as well as a sense of history to those visiting. The Anatolian Civilizations Museum offers natural history on display and they have so many items that it is impossible for them all to be displayed simultaneously. Early Bronze Age pieces, statues and wall paintings are just a few of what can be on display at any given time. The Hattusha ancient ruins are a World Heritage Site and offer tourists the chance to see an excavated site consisting of a temple and palace remains. 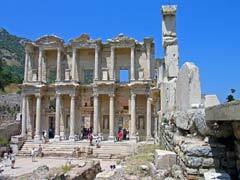 There are also parts of walls, gateways and other features that make this a historical Turkey tourist attraction. A Turkey vacation doesn’t have to be just about the history and traditions that make the country so interesting to see. They also have many natural wonders to behold, like the Pamukkale Thermal Pools located in the southwest. The white pools make it look like winter year round. Travertines, hanging limestone walls and the pools themselves make this a unique Turkey tourist attraction. No Turkey vacation is complete without a trip out to Cappadocia to see the rock formations, rippled landscapes and underground cities. There are many hiking trails, or you can choose to see the area from a hot air balloon which will take you over the lovely fairy chimneys that resemble tall, capped mushrooms. Kaymakki is one of 36 underground cities and is the largest uncovered so far. Here tourists can see wineries, stables, kitchens and living areas in the four floors that are open to the public. The Goreme Open Air Museum takes Turkey vacationers on and interesting trip around rock cut churches and other buildings, a lot with impressive frescoes. This World Heritage Site has eleven refectories in a museum, each being associated with a specific church built in the 10th, 11th or 13th century. A Nunnery, St. Barbara Church, Apple Church and many other unique structures are all there on display. 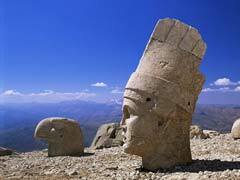 In southeast Turkey is the Nemrut Dagi, a mountain summit with many large statues surrounding it, most without their heads (don’t worry the heads are there as well, scattered throughout the area). This is another World Heritage Site in the country and is well worth a tour through. 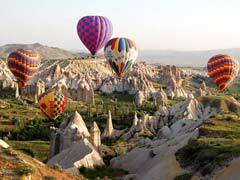 Turkey is a wonderful country to explore for both historical and scenic reasons. The many World Heritage Sites, museums and places of interest span the gamut of the history of the region so far and hold wonders for everyone to enjoy. Add to that the spectacular sites and popular Turkey beach resort towns like Antalya, Alanya or Marmaris and you have a vacation destination winner.